Yes it is almost August. Yes I am already thinking about Christmas. Have been since the day after last Christmas. I started buying then. I have 4 children in my home on Christmas Day and I need to be organized about everything. As I was searching Pinterest today for something a bit better I found a link to this App. Track what you have spent per person. You can set a budget for everyone. You can view by store so you know what you have to buy where. You can save the gift list from year to year. One of my favorite things is you can passcode protect the app so little snoopers can not open the app while playing on the phone. 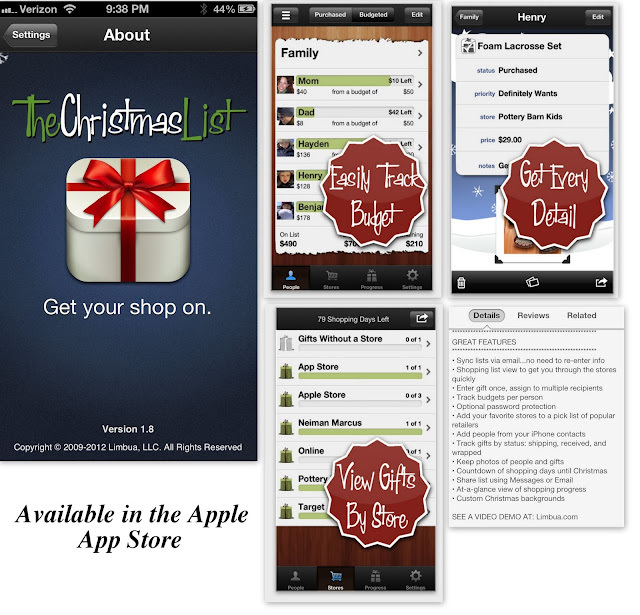 So for $.99 you can stay on top of your Christmas shopping. You only have 149 shopping days left after today so get a move on. What are your best organizing tips for the holidays?